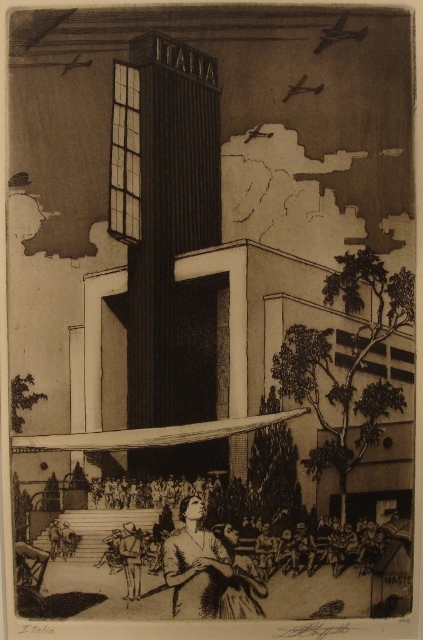 In an effort to stimulate interest in the Chicago World’s Fair of 1933 and 1934 and to further the art of etching, a prize of $500 was offered for the best etching with a Fair theme. This astoundingly large prize during the Depression created a great deal of interest and many members of the Chicago Society of Etchers participated in this competition including Charles Dahlgreen, Frances Foy, Arthur Hall, Gustaf Dahlstrom, Gerald Geerlings and L. O. (Louis Oscar) Griffith. Some really fine etchings were the result. This etching of the Italian Building was the L. O. Griffith entry. It is an aquatint and shows the skill of the artist in this technique. The theme of the fair was to show how advances in design, manufacturing and technology had modernized the world. The Griffith Italian Building etching conveys this theme with its distinctive building, the airplane laden sky, and the awestruck observers below. Louis Oscar Griffith was born in Nashville, Indiana in 1875. As a small boy his family moved to Dallas. In his late teens he worked as a hotel clerk and took lessons from Frank Reaugh in his spare time. Reaugh became his lifelong mentor. In 1893 he moved to Saint Louis to study at the Saint Louis School of Fine Arts and Museum. Two years late he moved to Chicago to work as a commercial artist and take lessons at the Chicago Art Institute. He was a founding member of the Chicago Society of Etchers. He also made many trips to Texas to participate in the Frank Reaugh art “field trips.” He was also a frequent visitor to Brown County Indiana and the developing art colony there. By 1922 he was married and had a son so he moved to Newcastle, Indiana – the center of the Brown County artist colony. He was one of the key members of that colony and a member of the Brown County Artists Association. Later in life he also established a studio in Dallas. He died in Franklin, Indiana in 1956. L.O. Griffith won numerous awards during his long career. His watercolors, oils and etchings are in the collections of museums throughout the United States.